Hawaii was first established by Polynesians, who arrived by canoe 1,500 years ago. In 1778, Captain James Cook arrived, claiming the land for Great Britain. 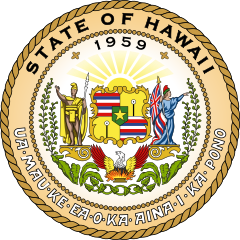 Hawaii became a U.S. territory in 1900, but did not become a U.S. state until 1959. In the 1800s, sugarcane plantations sprung up in Hawaii. Workers from Asia arrived, eager for jobs. 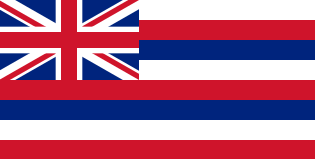 Hawaii is still a major producer of sugarcane, as well as pineapple. In 1941, Japanese fighter planes attacked Pearl Harbor, a military base in Hawaii. The U.S. responded by officially entering World War II. Hawaii was created by volcanic eruptions. The area has five volcanoes, two of which are currently active. The Pu’u ‘O’o vent on Kilauea has been erupting continuously since 1983, adding more than 568 acres of land to the island. This volcano’s lava, ash, and toxic gases sometimes put people and property at risk. The largest volcano in the world “Mauna Loa” is located in Hawaii. Beautiful beaches, mild weather, and warm water attract tourists to Hawaii, mainly from the U.S., Asia, Australia, and New Zealand. Watch a short video about Hawaii. Declan, Tobin. " All Facts for Kids about Hawaii ." Easy Science for Kids, Apr 2019. Web. 26 Apr 2019. < https://easyscienceforkids.com/hawaii/ >.